Let’s look a few examples. To complete the process, we specify a name for the output raster and the format we want to use. When you click OK, the operation will be performed and the new raster created, giving us a GeoTIFF with cell values in feet. If you leave the Add result to project box checked the output raster will be added to QGIS once the calculations are done. If you only want to operate on a portion of a raster, you can use the extent setting to limit the area included in the calculation. Sometimes you might want to mask out part of a raster. An example might be one where you have elevations ranging from below sea level to mountain tops. If you are only interested in elevations above sea level, you can use the raster calculator to create a mask and apply it to your raster all in one step. The first part of the expression in parentheses effectively says: for every cell greater than or equal to zero, set its value to 1, otherwise set it to 0. This creates the mask on the fly. In the second part of the expression, we multiply our raster ([email protected]) by the mask values. This sets every cell with an elevation less than zero to zero. When you click OK, the calculator will create a new raster with the mask applied. Using the raster calculator and a mask we can visually simulate a rise in sea level. To do this we simply create the mask and overlay it on the DEM or perhaps a DRG (topographic) raster. We added the DRG for the quadrangle and overlaid it with the mask layer. Setting the transparency to 70% allows the DRG to be seen, illustrating the effect of raising sea level. The raster calculator is a powerful tool. Check it out and see how you might use it in your analysis and map making. 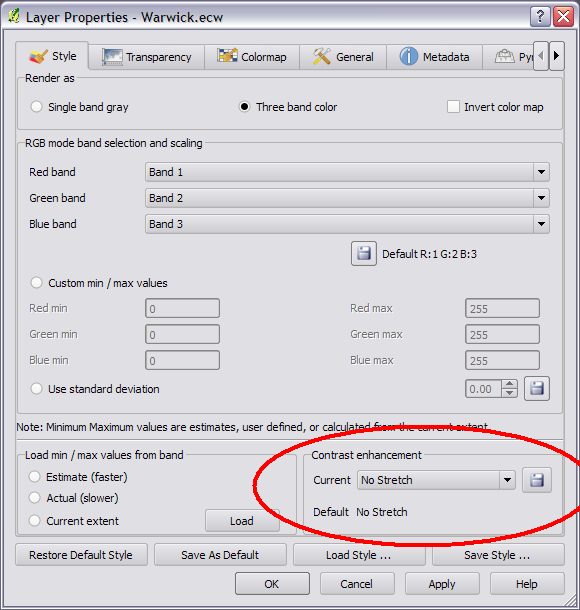 Slow opening of rasters in QGIS 1.7? Here is a fix. Note: The following post only applies to QGIS 1.7. QGIS 1.7.1 (upcoming patch) will not have this issue as the default behavior has changed. One thing I noticed when running QGIS 1.7 was my rasters were really slow to open and sometimes froze QGIS. I thought maybe it was some bad plugin that I had installed, nope; maybe opening the raster of the network drive was causing it to be slow, nope. I tried a bunch of stuff, still nothing. After a while a few other people posted to the mailing list saying they were having the same issue, turns out the solution was very simple. In QGIS contrast enhancement for rasters is turned on by default, so each time a raster is opened QGIS had to calculate the stats (max and min for example) for the raster and then scale the contrast. For a large raster this is pretty heavy and this was the cause of all those problems. Turns out QGIS will remember the contrast setting for all rasters if you want it to. That setting will now be remembered for each raster that is opened and improve the loading time. On a similar note. Tim over at http://linfiniti.com has done some work to improve the raster performance even more with http://linfiniti.com/2011/08/improvements-to-raster-performance-in-qgis-master/ . The improvements that Tim has made are available in the nightly build of QGIS via qgis-dev in OSGeo4W, or by building the master line from github.com.